Muscular, well developed, in proportion to dog's build, fitting into well sloping shoulders. Chest moderately broad with prominent breastbone. Body fairly long and strong, with deep brisket, well sprung ribs, clearly defined waist. Top line level. Neck - moderately long and muscular without throatiness. Well developed, especially in males, and in proportion to the dog's build. Neck well set on; fits into strong, well shaped shoulders. Topline - level. Body - long and strong. Chest - moderately broad withprominent breastbone. Deep brisket, with well sprung ribs to allow for good lungs. Ribs extending well back. Loin- short, strong, moderately tucked up. Waist well defined. current CWCA (UK) Standard still does.) This meant that we were measuring from two moveable points as the top of the shoulder blade can move forward or backwards, depending on the layback (angulation) of the shoulder. The tailset can also move forward or backwards, depending on the slope of croup and set of the tail. anatomical detail, please refer to the drawing of the Cardigan skeleton shown above. Total body length-to-height ratio measured from prosternum to ischium (including hair) should be not quite 2 to 1, that is, the body should be not quite twice as long as it is tall. 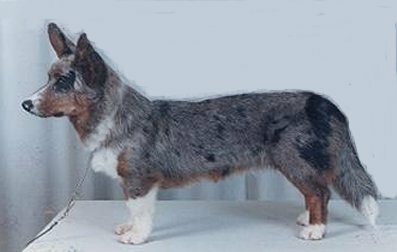 While the UK Standard does not specify a body length to height ratio of 1.8 to 1, the US (AKC) Standard is quite specific on this point. RIBBING: The thorax (chest cavity) must provide plenty of room for the major organs, the heart and lungs, but this should come from depth of chest from withers to sternum rather than too much breadth between the elbows. Ribs should be well sprung and more oval in shape rather than round, with the point of the oval facing down. Between the elbows the rib shape is a bit like an upside down pear, widening out behind the elbows to an upside down egg. A broad, flat chest, lacking a prominent breast bone, or a narrow slab-sided chest are untypical. Length of body should come from length of rib cage rather than length of loin. 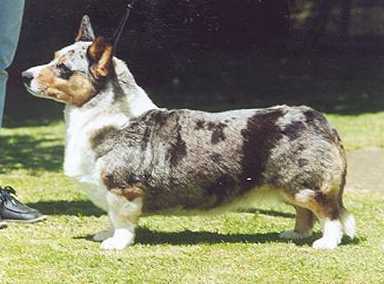 A too short body is untypical for the breed and a long loin is a sign of weakness. While the standards do not address the issue, the length of ribbing should be approximately twice as long as the length of loin. LEG LENGTH & GROUND CLEARANCE: While the standards do not address the issue, the question has arisen about the proportions of body and leg length. The chest should be deep enough to "fill in" the crook in the front legs. The distance from withers to elbow should roughly measure equal to the distance from elbow to ground. As well, there needs to be some room for ground clearance underneath the chest. When looking at the body to leg length proportion, overall balance and blending of the parts is most important. Remember that Cardiganshire is very rocky and hilly country. visually we will perceive a level topline. The topline can best be described as a very gentle, flattened S on its side. The S curves down from the neck over the withers and into that little depression behind the withers, then up and over the loin area, and then down again over the croup to the tail. Visually, we see a straight line, achieved through the filling in of the muscles, skin, subcutaneous fat, and hair. A judge can feel that gentle S curve underneath all the hair, fat and skin, as his/her hand comes down the neck, over the high spinous processes of the withers, and down again into the little depression behind the withers, etc. As the judge passes his/her hand over the loin, s/he will feel that very subtle arch of the muscles through the loin area. That is one of the indicators of the athletic condition of the dog. This slight rise over the loin should be obvious when you feel the back, but not so when you stand back and look. 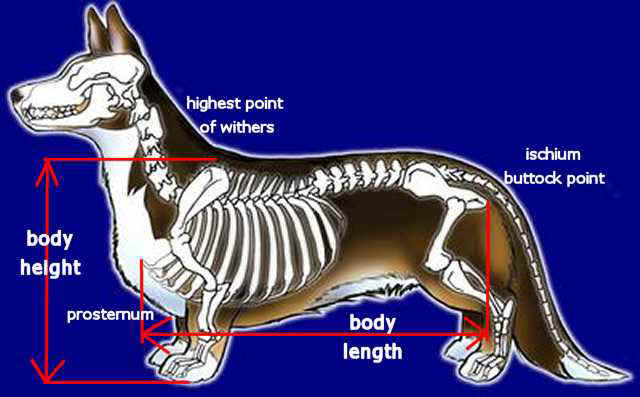 If the loin area muscle is slack (giving a straight topline) then we know that the dog is not in peak condition. If the loin area is so rigid that it is almost in spasm, then again we know that there is a problem. 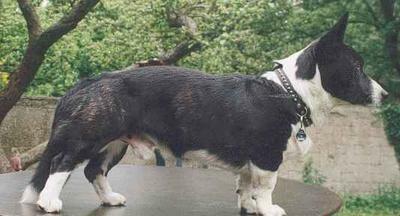 These points in the two standards indicate a definite breed difference between the Pembrokeshire and Cardiganshire Welsh Corgi. Viewed from ABOVE, the Pembroke's body tapers smoothly to the rear and shows more width through the forequarters than the hips. Unlike the Cardigan, it should appear fairly squared off over the croup due to the flatter set of the pelvis. In CONTRAST (again viewed from above) the Cardigan has a well-defined waist and is strong, muscular and more rounded in the hindquarters. 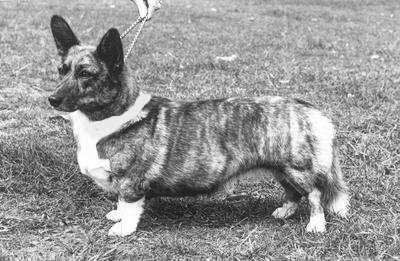 Although the tuck-up referred to in the US breed standard is not mentioned in the UK standard, it comes with the Cardigan's well sprung ribs and well defined waist. 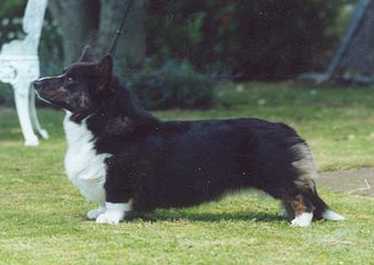 This tuck-up can be seen in the underline and represents another significant breed difference between the Cardigan Welsh Corgi and the Pembroke. Photos to illustrate the difference between a Cardi body and a Pem body (far right). Notice how the waist of the Cardis is clearly defined and the body gets wider again over the hips, while the Pembroke gradually tapers towards the rear. Does have a correct well-developed neck and prominent prosternum. Shows body length, however the length is coming from an incorrect long loin and short ribcage. This is a very important breed specific trait and should not be overlooked. Chest is deep; however the ribbing is too short. 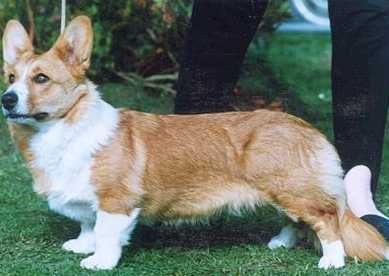 Note well defined waist on this dog with tuck up, although tuck up is perhaps too accentuated due to following the curve of the loin and topline. Topline not level. The feet are oval rather than round. Shows a pleasing outline and silhouette with a strong level topline and long body. Chest is moderately broad with a prominent breastbone. Has well sprung ribs which extend well back. The loin is short, and moderately tucked up. Waist is well defined. Head is turned, so length of neck cannot quite be assessed, though it appears acceptable. VERY PLEASING. Does not show the correct outline and body. Lacks body, bone, depth of chest and prominent prosternum. The topline is not level, but rises sharply to the rear. Ribbons should be withheld on this dog. Overall pleasing in level topline, length of body and tuck-up, but is overdone in the chest, drops too low in the chest, and is bulky and throaty in the neck. Hands on would indicate if the dog is carrying too much weight. could have a bit more length of body, as it appears "stuffy" and topline could be more level; it dips a bit, then rises uphill. Roached topline, straight angulation both front and rear, leggy, long in hocks and fine bone. Ribbons should be withheld on this dog.